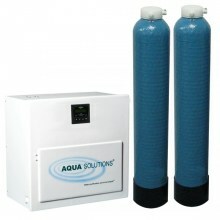 This AQUA SOLUTIONS unit operates on ordinary tapwater. For pre-treated water operations, see (Model: 2035B). Laboratory water purification systems are also available with a built-in Dual wavelength UV Oxidizer/Sterilizer (Model: 2036BL). This system produces 18.2 Megohm-cm type I ultrapure, reagent grade water that is free of Pyrogen, Endotoxin, RNase and DNase at a flow rate of 8-12 Liters/minute. The unit operates on pre-treated feed water that contains less than 20 PPM of total dissolved solids. This laboratory water purification system also includes a built-in 5,000 MWCO ultrafilter cartridge. The built-in UV Sterilizer prevents the growth of microorganisms within the system and alerts you when it is time to change the UV lamp. Under all sections, ensure that there is no period after every entry.